I almost wasn't going to follow this week's prompt but then I thought to myself. Wait a minute, what do I know about my step great grandmother Sylvia Sheppard Bryant? I can't say I know half as much about her as I do about my great grandmother Ophelia Jones Bryant. I knew Sylvia married my great grandfather Frank Bryant after he had been living as a widower for a few years. In my last post, So That's Where They Were Married! But Why? 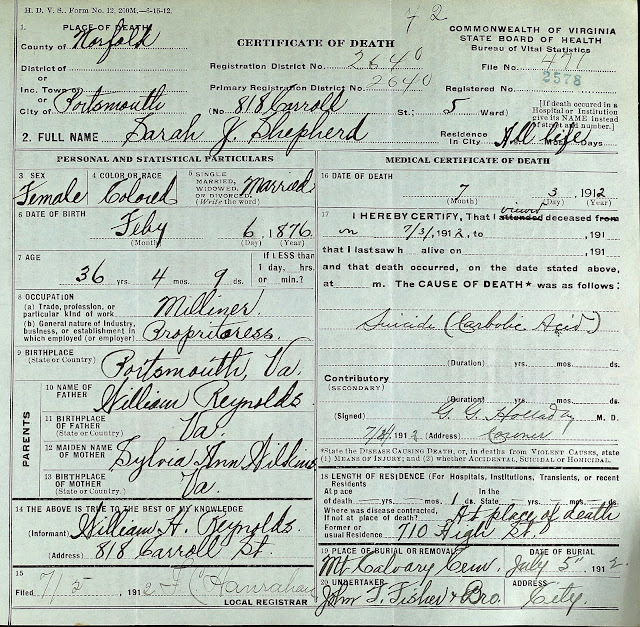 I featured a copy of Sylvia and Frank's marriage certificate which I was only able to find recently. For this post, I decided to summarize what I do know about her life. This way I have it all in one place and perhaps someone who's related may come across this post and be able to add some details about her life. 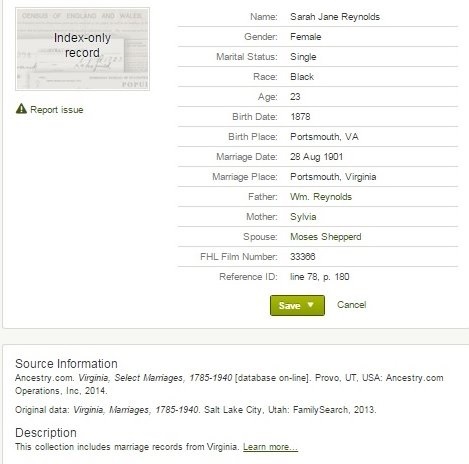 According to her marriage license, Sylvia was born on June 5, 1906 in Portsmouth, VA. Unfortunately, there wasn't any information listed regarding who her parents were. Would looking at the census reveal any clues? I believe the answer to that question is, Yes! Here's little Sylvia residing with her father, Moses Sheppard, and mother, Sarah Jane Reynolds, in Portsmouth, VA. William H Reynolds who was also living with the family was Sylvia's uncle and Sarah's brother. 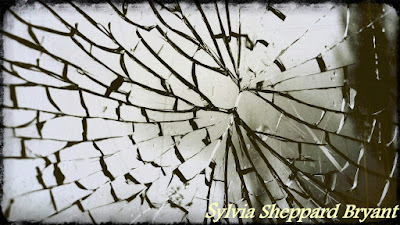 Now I am going to back track a minute to a post I wrote back in June 2011 called So who was Sylvia Bryant? Harkless Wooten to the rescue. In that post, I shared one of my mother's memories of her step grandmother. 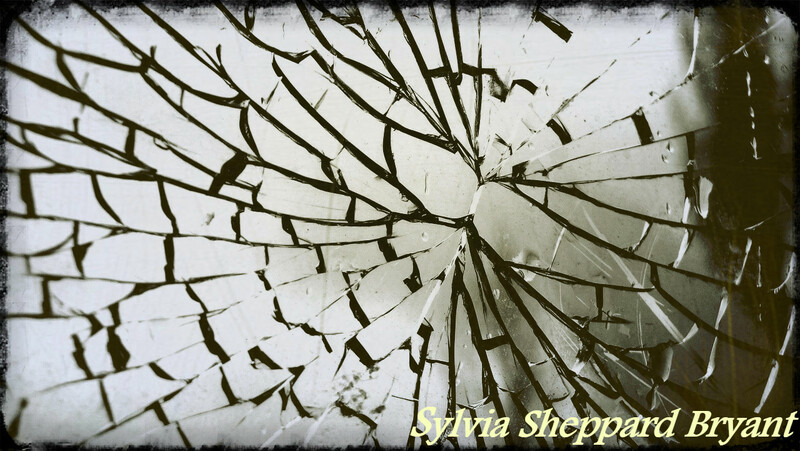 She described Sylvia as being "interesting." My mother recalled how her step grandmother wasn't exactly the best hostess during one particular visit to Morehead City. I think the "interesting" description was a polite way of saying that Sylvia was perhaps just a little bit off. Something wasn't quite right with her. That initial bit of oral history made me curious to know what was Sylvia Sheppard Bryant's upbringing like. Did she come from a stable home? What were her parents like? Now let's take a look at Moses Sheppard and Sarah Jane Reynolds. Sarah married her husband Moses on August 28, 1901 in Portsmouth Virginia. Her parents were a William Reynolds and would you look a here! Sarah's mother's name was Sylvia. So I know now that Sarah Jane Reynolds Sheppard named her daughter Sylvia, to pay tribute to her own mother. I know from the 1910 census that Sarah had given birth to two children during the course of her marriage but only one survived, that one child being Sylvia. Sarah was a milliner (hatmaker)who had her own business. That's pretty cool. Moses Sheppard's occupation in 1910 was listed as a "laborer" at the "navy yard." At a glance it looked like the Sheppard household was a stable one. Source Information: Ancestry.com. Virginia, Death Records, 1912-2014 [database on-line]. Sarah Jane Reynolds Sheppard committed suicide via carbolic acid ingestion on July 3, 1912. She died at her place of work/residence at 710 High St in Portsmouth, VA. Source Information: Ancestry.com. U.S. City Directories, 1821-1989 [database on-line]. Provo, UT, USA: Ancestry.com Operations, Inc., 2011. I had no idea what carbolic acid was so of course that was the next thing I googled. Phenol is so inexpensive that it attracts many small-scale uses. It once was widely used as an antiseptic, especially as carbolic soap, from the early 1900s to the 1970s. As I reviewed through the search results that came up when I typed in "carbolic acid" and "suicide," I soon learned that suicide by this method was somewhat of a popular thing during the late 1800's to early 1900's. It was not a pleasant way to go. Carbolic acid is corrosive to mucus membranes, and skin. The pain is excruciating. It can affect the nervous system by causing seizures and coma. You can read about additional symptoms of carbolic acid poisoning here. What an awful way to die! Sylvia Sheppard would have been about 6--8 years old at the time of her mother's death. As a mother, I hope and pray that little Sylvia was not present when Sarah died. Some things a child just shouldn't see. Forever changed by this tragic event, my step great grandmother had to find the strength to carry on. It's just sad because a little girl learns so much from her mother. She did still have her father Moses Sheppard to lean on. Or did she? This is the 1920 Federal Census. Moses was residing as a lodger at 704 Columbia St in Portsmouth, VA. Where was Sylvia Sheppard? I have to stop here. As I have been researching Sylvia's Sheppard Bryant's life, her story has become ever more fascinating to me. The folks that helped Sylvia after her mother's passing were some inspiring people. They deserve mentioning and I don't want this post to become too long. So tune in later today or early tomorrow for part two.